This product from Chess Baron: Free Shipping for UK. Another example of DGT quality! The 1001 Black is a universal game timer suitable for school, club or home use. It has a crystal clear display, is extremely easy to use and very affordable. 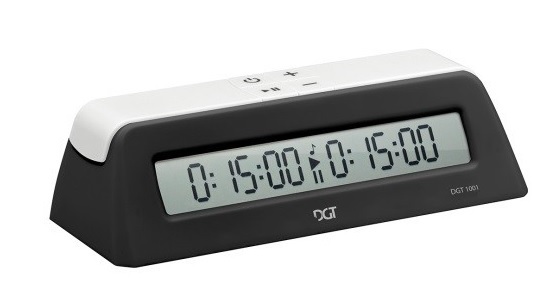 The DGT 1001 features countdown and up-count and has two large buttons on the top left and right to operate the timer. The clock does not have any bonus or delay options. Battery included. The Family Review Center gave this clock it' Seal of Approval and Editor's Choice Awards to the DGT1001 because it is: "Easy to understand and use right out of the box. Great for count up or count down. Small and compact, so easy to transport from place to place. Solid design and standard features make this a great companion to every chess lover. Works well for other games as well." Chess Baron Chess: Because we know you care - we care. Buy Peace of mind - Buy Chess Baron. 15 x 6cm. High quality digital chess clock - Black. Batteries Included!